Part of the shared values and characteristics which make both Israel and America successful stem from the diversity in each country’s population; each is a country of immigrants. The different ethnic, national and religious attributes included in these national fabrics weave together symbiotic and collaborative complements leading to vanguards of invention. However, anyone who has spent time in either of these paradigmatic democracies knows that they are full of divisiveness and exclusion based on these very same diversities. 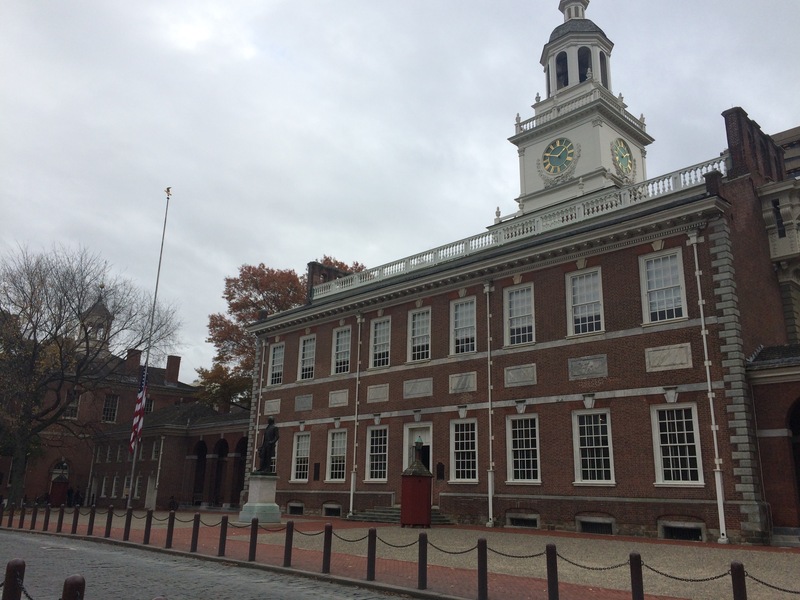 Our great democracies do not always bring to fruition the ideals upon which they were founded as stated in their Declarations of Independence. On November 24, the US State Department issued a travel alert. In it, the State Department wrote, “In the past year, there have been multiple attacks in France, Nigeria, Denmark, Turkey, and Mali. ISIL/Da’esh has claimed responsibility for the bombing of a Russian airliner in Egypt.” The statement referred both to attacks organized by large terrorist organizations, as well as those carried out by “unaffiliated persons planning attacks inspired by major terrorist organizations but conducted on an individual basis.“ Certainly Israel should have been included in that list, but it was not. In the wake of the Paris attacks, France’s flag was overlaid on millions of Facebook personal profile images in solidarity. Numerous Israelis, felt excluded asking, why doesn’t the world stand in solidarity with us when we suffer terrorist attack, or, as is the current situation, a wave of multiple terrorist attacks? Somehow, terror against civilians in Israel is not viewed the same as terror in the West – even when the victim is not Israeli, but American. Ezra Schwartz, was gunned down with two others while he was volunteering giving care packages to soldiers in Gush Etzion (the enclave of the West Bank entirely under Israel’s control, which has pre-State Jewish communities and which, according to the national consensus, will remain part of Israel even if there is a “land for peace” deal). Ezra, an 18-year old native of Sharon, Massachusetts who was studying in Israel during his gap year between finishing Maimonides high school in Boston and Rutgers University, was a victim of terror the same week as there were attacks in Mali and Paris. And yet, no mention of Ezra, of his selfless volunteerism, his friendly and outgoing nature which had helped lonely campers at Camp Yavneh or his commitment to doing the right thing and encouraging others to be true to themselves. It took three days for a White House official, National Security Council spokesperson Ned Price, to offer condolences to the family saying,”We were deeply saddened to learn about the death of Ezra Schwartz, an American citizen from Massachusetts who was murdered in a terrorist attack…. We extend our deepest condolences to the victim’s family, friends and community….” And this belated statement came only as a direct response to a question posed by the Jerusalem Post. 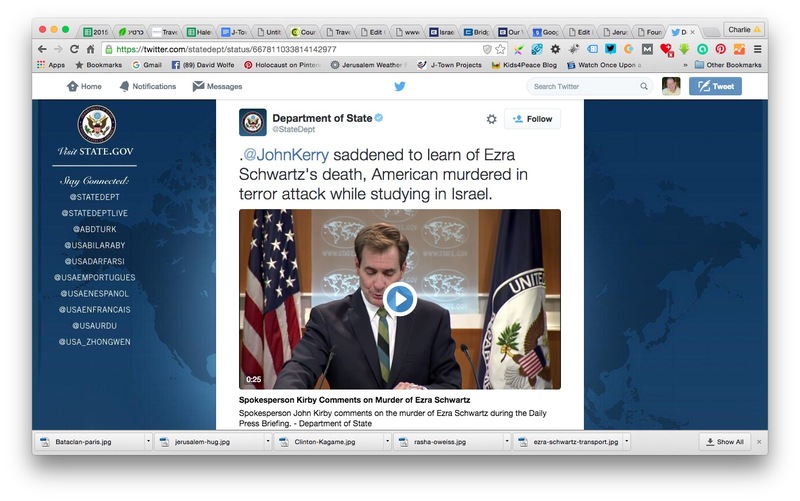 While the State Department had commented on Ezra Schwartz’s murder at a scheduled briefing, in John Kerry’s Twitter feed and through the United States Ambassador to Israel, the omission by Obama in his statement is glaring and hurtful. In less than two weeks it resulted in a petition on the White House’s website signed by over 50,000 people. Out of this pain comes resentment and a feeling of exclusion by a large segment of the population. However, we exclude many others as well. This isn’t “a Jewish thing.” Two days before the Paris attacks, 43 people were killed by a suicide?bomb attack perpetrated by an ISIS supporter in Beirut. Many other innocents have been murdered in countries such as Syria, Iraq, Turkey, Lebanon, Pakistan, Serbia, Yemen, Nigeria, Sudan, Somalia, Cameroon, Bahrain, Egypt, Algeria, Afghanistan, Libya, Chad, Kenya, Brazil, Congo DRC, Mexico, and Tunisia. Last month, a bomb went off at a funeral in Bangladesh, and we do not see it. 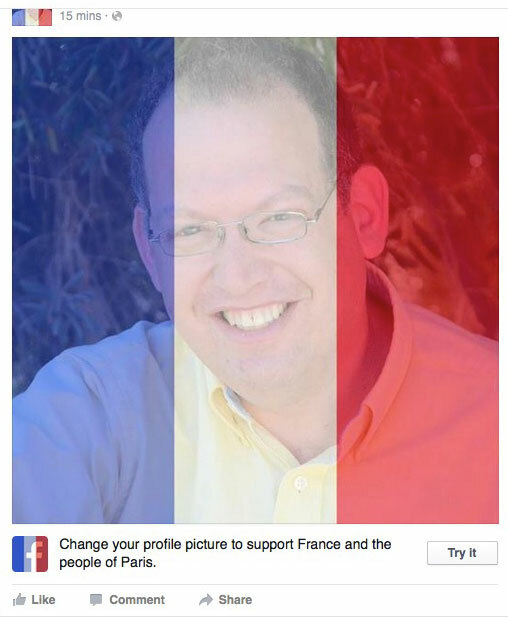 When Paris is attacked, Facebook promotes solidarity with a flag overlay. The US lowers its flag to half staff, but how would you feel if your loved one was murdered in a similar attack and the world was silent and you were neglected? What if you felt no one could see you – that you were helpless and invisible. 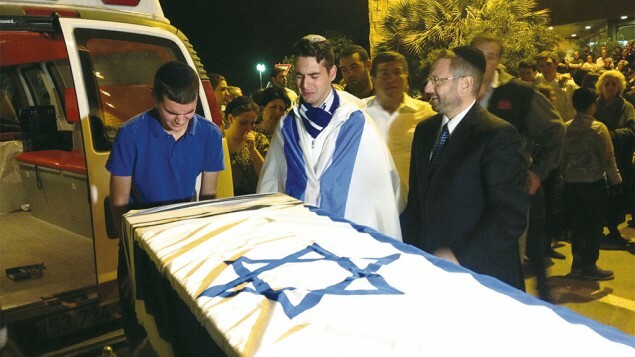 After the attack which killed Ezra Schwartz, the Israeli government placed ads of condolence in the Israeli press expressing its grief at the death of two victims of terror in Gush Etzion, Yaakov Don and Ezra Yehiel Schwartz. But there was no mention of Shadi Arafa, a young man in his twenties from Hebron. He was killed at the same time, in the same attack. Is Shadi’s life worth any less than Yaakov or Ezra’s. Neither Shadi nor Ezra were Israeli citizens. Why did the Israeli government not mourn Shadi’s death or extend condolences to his family? The world seems shocked that the young men who carried out the terrorist attacks in Paris were European-born. However, in hindsight, is it surprising that when they felt their opportunities were curtailed because of their background, these young men embraced that very same identity to the extreme and sought meaning and significance through an organization which paid attention to them and encouraged them to be who they were? Is it hard to imagine that they felt animosity towards a society which preached democracy but which left them feeling like outsiders, having to work hard just for basic acceptance and a fair shake? So, too, the Palestinian teens who may have been acting as “lone wolves” over the last two months see no way for themselves to have a future of full acceptance and integration within their lifetimes. An increasing number of Palestinian girls and women are carrying out terrorist attacks, possibly the first time in their lives they took a major step without patriarchal approval. 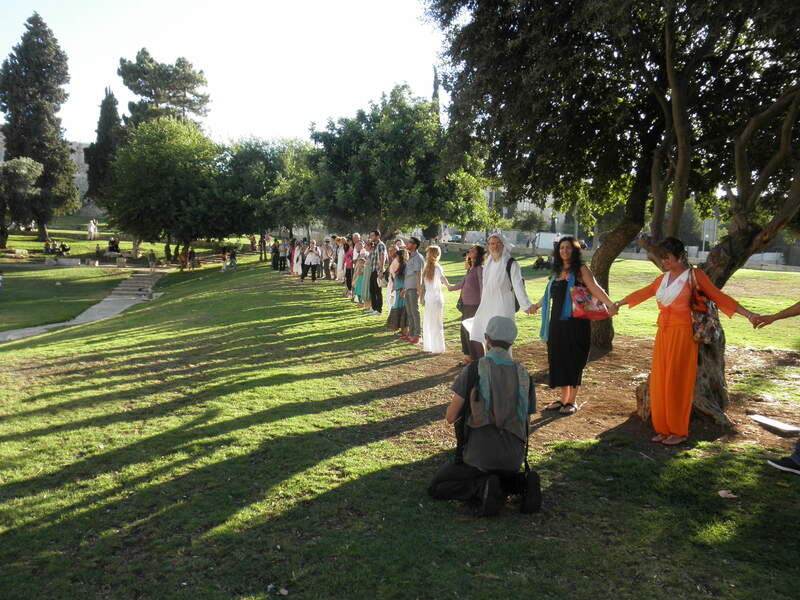 Since October, over a dozen Palestinian women have tried to carry out attracts against Israeli civilians and, often, the families of these women are shocked that they would carry out such acts. 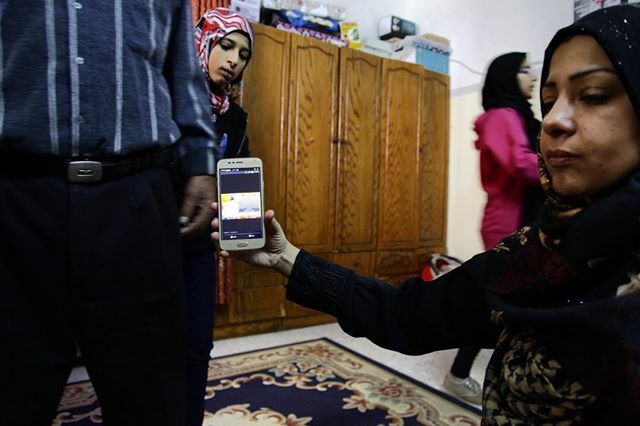 Dalia, 32, a cousin of of Rasha Oweiss, 23, holds her smart phone showing a photograph of the letter that was found in Rasha’s bag after she was killed as she walked toward an #israeli military checkpoint with a knife. Young women have perpetrated, attempted to perpetrate or are suspected to perpetrate a fifth of all stabbing attacks in the current #Palestinian uprising. Reporting for the New York Times. The situation in no way justifies acts of terror. However, in a world with virtual communities where teens and young adults can find acceptance, encouragement, inclusion and support when their families and communities seem to abandon and not understand them, the rise in extremism is not surprising. It is fertile recruiting grounds for social media empowered ISIS. Just as the counter-culture movement and cults preyed upon this population in the last half of the 20th century, religious national extremism is offering a home to those in need today. When parents and society send youth a message that they are a drain and a burden, ISIS, like gangs in the inner city, offer them not only a sense of belonging and acceptance, but a sense of purpose and extreme significance. The United States is no exception. One does not need to look in the international arena to find young people who are alienated and feel excluded. This is their natural state of being. However, these people, especially women, are finding a home – even in the USA – with ISIS. According to the New York Times, this year over 50 people have been arrested in the US for supporting and plotting with ISIS and of those arrested in the last 18 months, according to the assistant attorney general for national security, John P. Carlin, 80% were under 30 years old and 40% were under 21. The vast majority were home-grown Americans. In our fear, some have retreated and taken an isolationist point of view calling on a ban on refugees. This seems, by all rational accounts to be reactionary and ridiculous as refugees go through a long vetting process, much stricter than those who seek to immigrate from places like the borderless European Union. The United States has always tried to draw a fine balance between civil liberties and what some would call security; what others would call fear. As Jews, we must speak out and encourage the ingathering of all immigrants seeking a better future, but this is especially true of refugees, as almost all of our forbearers sought refuge in America. What is more, as Jews, we must always be the watchdog for discrimination and xenophobia. In the month that Jonathan Pollard was released from prison after being paroled from his excessive sentence, how can any Jew not be mindful of the backlash against Jews which may be created if we start questioning an American’s loyalty based on religion? 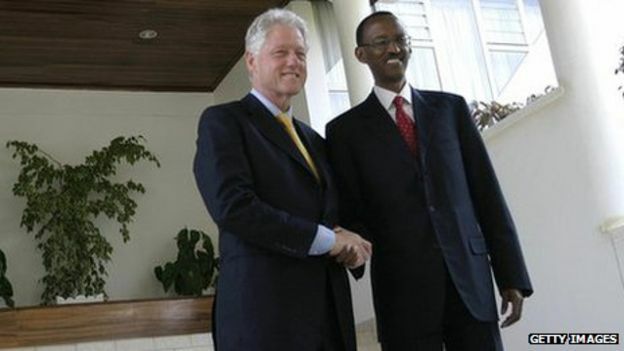 He turned to the President of Rwanda and apologized, calling his inaction during the massacre his biggest failure as President. President Clinton said he he had been too involved in Bosnia, proving that a Christian nation could care about Muslims, that by the time he focussed on Rwanda, it was too late. But President Clinton, in that speech, provided they key to solving our current threat. He said that when he went to Rwanda, he learned that the traditional greeting is “I see you” and we must learn to see each other. There will always be those who prey on our youth. The way to combat this is to offer our children a place of belonging and acceptance. My wife is a psychologist, who for many years specialized in treating teens at risk. Over and over she saw the same pattern. Teens who did not fit in to their communities would act out. Those parents who reacted against this would push their children farther away and often these children left the community and lifestyle of their parents. Those parents who loved their children through trials and rebellions, who offered positive messages of encouragement, who provided physical security, acceptance and flexibility, enabled their children to explore and return to a place of safety with positive and productive relationships similar to those envisioned by their parents in their communities. We need to see the children and the stranger in our midsts and we need to include them and to give them opportunities to be who they are and live a life of self-empowerment and self-determination. Hamas rose in power in Gaza through a network of schools and social services, meeting the needs of the people. If Western countries live up to their ideals, and nurture their needy populations, foreign-based terrorism will have much less fertile recruiting grounds. In our hearts and with our words we must seek and offer more inclusiveness to those who need it most. We must focus on our common humanity instead of drawing distinctions highlighting our differences. We need to really see each person in our society as part of our society. The more different we are, the more we need to come together as one, to work at communication and understanding, embracing those differences as part of what can connect us to our world and be greater than ourselves. If we are to win this war, we must focus on love and inclusiveness, not fear and intolerance. This entry was posted in Author's Favorites, Published in The Jewish Community Voice of Southern NJ, War, Peace and Terrorism and tagged American culture, education, Hamas, Hizbollah, Iran, Iraq, Israeli politics, language, media, Palestinians, Photos, Terrorism on December 8, 2015 by charlie. Just Register for free or Log In and add your comment after the post.